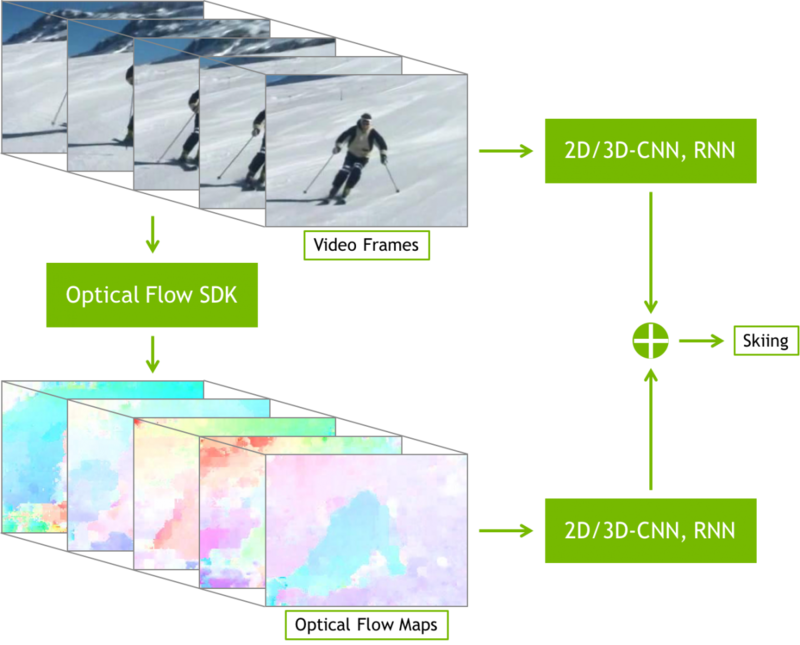 Optical Flow SDK exposes the latest hardware capability of Turing GPUs dedicated to computing the relative motion of pixels between images. The hardware uses sophisticated algorithms to yield highly accurate flow vectors, with robust frame-to-frame intensity variations and tracks the true object motion faster and more accurately. NVIDIA GeForce, Quadro and Tesla products with Turing generation GPUs. Until a few years ago, tasks such as recognizing and tracking an object or classifying an action in video streams were out of reach for computers due to complexity involved. With the advent of Deep Neural Networks (DNNs) and massive acceleration made possible by GPUs, all these tasks can now be automated. Some of the most important applications of optical flow are: tracking objects within video frames, video action recognition, stereo depth estimation etc. Optical Flow also benefits many other use cases including: Stereo depth estimation, video frame interpolation and extrapolation. Optical Flow functionality in Turing GPUs accelerates these use-cases by offloading the intensive flow vector computation to a dedicated hardware engine on the GPU silicon, thereby freeing up GPU and CPU cycles for other tasks. This functionality in hardware is independent of CUDA cores.